Being notified of when something happens in your environment has always been important and has evolved over time from basic emails to IM messages via tools like Slack. This post will cover posting alarm information to Slack via StackStorm. In addition post alarm information to Slack we can take autoremediation actions in response to alarms which we’ll cover in later posts. In order for our vSphere instance to communicate with StackStorm we need to provide vSphere with some way of authenticating to our StackStorm server. The solution is to create an API key that our script will use to connect to StackStorm. Now we’ll create our webhook to allow vSphere to communicate with StackStorm. We’ll create go ahead and rule which will also handle the creation of our webhook. We’ll name our rule vsphere_alarm_slack and we’ll place it in the default pack. 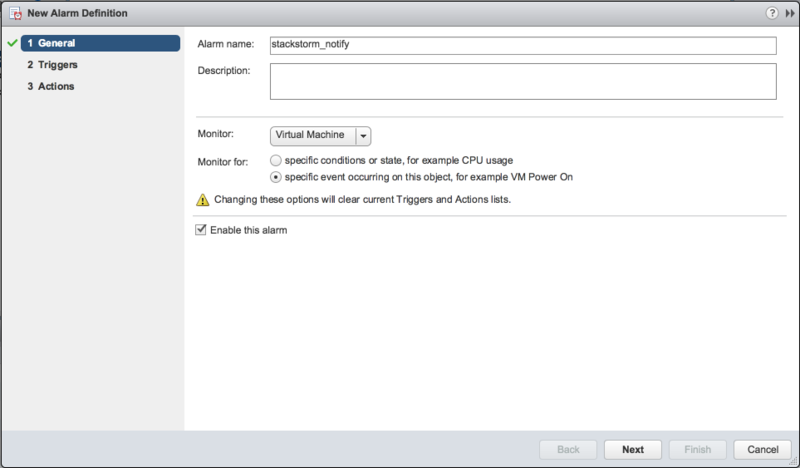 description: "Post vSphere alarms to Slack"
This configuration assumes that chatops has been configured to allow StackStorm to post to Slack. With StackStorm configured we can now dig into creating our script to call the webhook from our VCSA when the alarm is triggered. We’ll create a scripts directory to store our scripts. 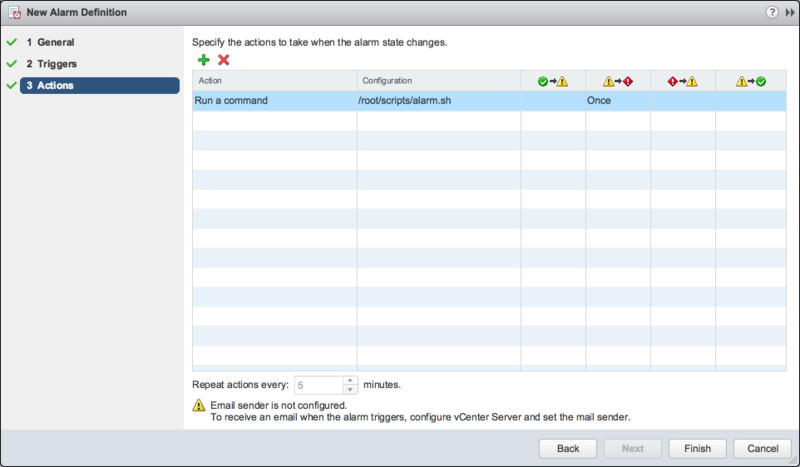 The last step is for us to create the vSphere alarm that we’ll be notified of via Slack. Of course we could use an existing alarm as well. Click the green plus from the “Manage > Alarm Definitions” section of the VM we want to test with. We’ll give the alarm a name of “stackstorm_notify” and select “specific event occuring on this object, for example VM Power On” from the change the “Monitor for:” section. 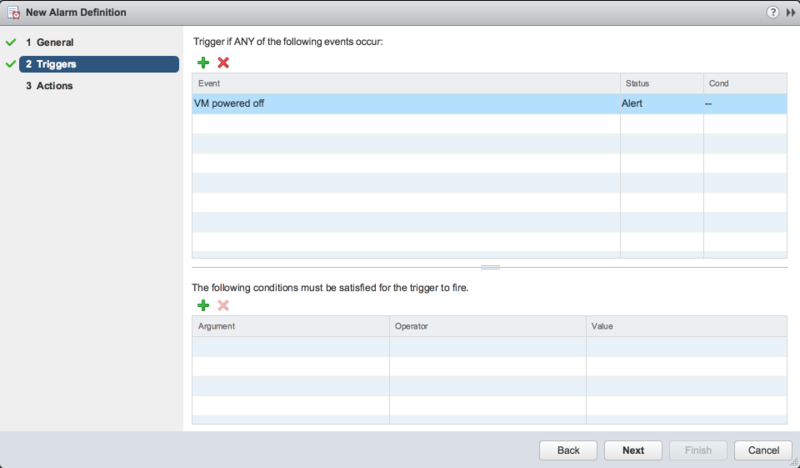 Click the green plus and select “VM powered off” from the drop-down list of event options under the “Trigger if ANY of the following events occur:” section. Click the green plus and select “Run a command” from the action drop-down list. Add the path of our vSphere script in the “Configuration field” and select “Once” from the yellow to red section. Now that our rule and webhook have been created let’s go ahead and test our Alarm by powering off our VM. If everything has been configured correctly we get a fancy message in Slack regarding the alarm. This is just a basic example of the value that StackStorm can bring to a vSphere environment.